If you don't need an automated cappuccino function, the Delonghi Magnifica ESAM4200 is one of the best bean-to-cup coffee machines - especially considering the low price. It produces beautiful crema, a rich espresso and can froth dense foam for milky coffees. It's an excellent choice. 3.1 Is the spout tall enough for a “regular” mug? 3.2 Delonghi ESAM 2800 Vs ESAM 4200 – What’s the Difference? 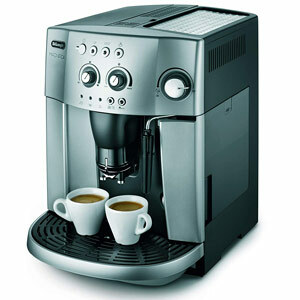 The Delonghi Magnifica ESAM4200 is a popular bean-to-cup coffee machine that makes automated espresso. It also has a manual milk frothing arm for cappuccino, various customisation settings and is available for a great price. How does the ESAM4200 compare to other coffee machines though? Does it produce quality espresso? And is it easy to use and maintain? Keep reading our ESAM4200 review to find out. 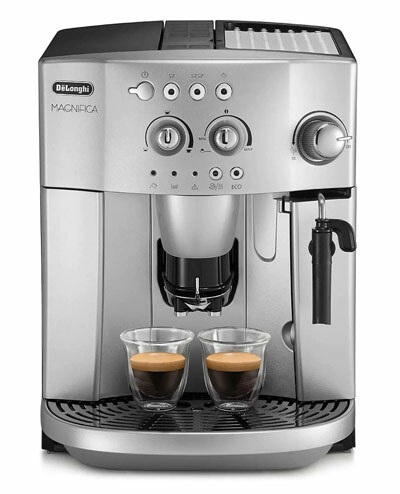 The Delonghi Magnifica ESAM4200 is a mid-range model that’s been around for several years. It lacks the advanced features of newer coffee machines, but makes up for this with excellent design and gorgeous espresso. Let’s take a closer look at its features and design. The Delonghi Magnifica ESAM4200 has an attractive design that won’t look out of place in any modern kitchen. It’s available in two colours – ESAM 4200.S (silver) and ESAM 4200.B (black) – and features a dial-based control panel. It doesn’t have the advanced LED panels of newer machines, but many people prefer a more tactile control system. If we had a complaint about the appearance, it’s that the exterior is mainly plastic rather than metal. It doesn’t look cheap or tacky though, so this isn’t a major drawback. Delonghi has clearly put a lot of thought into improving the ESAM 4200, without pushing the price out of the average coffee enthusiast’s reach. It has new a brewing unit, thermoblock (for maintaining a consistent temperature), dual boiler system and Delonghi’s redesigned integrated grinder, yet is sold for a reasonable RRP of £450 (and is often available for less than this). In terms of size, the dimensions of 28.5cm x 37.5cm and 36cm (WxDxH) are around average, although it’s certainly not the most compact model on the market. It also weighs 10kg, so it’s quite a bulky machine. While it might not be the most portable coffee machine, it’s designed to be easy to use. Making an espresso is as simple as pressing either one or two cups – the machine handles everything else. You’ll want to read through the short manual once or twice to understand the various features, but after that it’s mostly self-explanatory. Internally, the Magnifica ESAM 4200 has the standard 15 bar pump pressure and a removable brewing unit. These combine to make fantastic espresso – but more on that in the next section. There are dual spouts for brewing two espresso cups simultaneously, which is great if you often drink coffee with a friend or partner. While this is a feature found on many mid-range bean-to-cup machines, there are some that only have a single spout (such as the Jura ENA Micro 1). You can also adjust the spout height depending on the type of cup you’re using. As with many bean-to-cup machines, there’s the option of using pre-ground coffee. You’ll probably only want this feature if you drink decaf – freshly ground beans always have a better taste – but it’s a useful addition if you enjoy a night-time coffee but don’t want too much caffeine. Speaking of night time coffees, the ESAM 4200 has an upgraded grinder that’s designed to be quieter than most. Delonghi even refers to this as “Silent,” but it’s certainly not silent, even though it makes less noise than previous models. In reality, the bean grinding is still quite loud. There’s also a 1.8 litre water tank, which is far from the biggest on the market. The tank is easy to remove for refilling, and you can remove the top of the tank to clean it. It’s also possible to see the water level, which isn’t always the case. A problem with the design is that the warning lights can be confusing. It’s not always clear what they are trying to tell you, so keep the manual on-hand for when you need to decipher a message. On the plus side, the Magnifica ESAM4200 has been sold for years without any apparent reliability issues. If you’re looking for a simple machine that’s built to last, it’s a great choice. One of the advantages of bean-to-cup coffee machines is that you can adjust settings to suit your personal tastes. The Magnifica ESAM4200 is great for this, as it provides multiple options and settings. The built-in burr grinder has 13 coarseness settings. This allows you to fine-tine your coffee’s taste, as grind coarseness affects extraction rates. Delonghi has also included settings for coffee quantity, water quantity, temperature and cup size. There’s even a programmable hard water setting adjusting the brewing process depending on your local area’s water composition. One feature we really like about the ESAM 4200 is the dial system for adjusting taste. The coffee strength dial, for example, adjusts the quantity of beans used when brewing. There’s also a dial for adjusting the size of the coffee cup, which makes it easy to deliver the correct amount. There’s no option to save user settings though. If you several people making coffee in your household, they’ll need to remember their favourite options. Making espresso, ristretto or long coffee is as simple as pressing a single button. It really is that easy once you’ve found settings you enjoy. This simplicity hides a complex brewing process though – and it’s brilliantly effective. The ESAM4200 brews aromatic espresso with a rich crema. It’s also consistent, so you always get a gorgeous crema and wonderful coffee. In fact, we think the espresso can almost match coffee shop drinks. It’s not quite there, but close enough for most people. A quick tip though: use pre-warmed cups for best results. And if you’re struggling to get espresso that’s hot enough, try switching off the “Eco” mode. The Magnifica ESAM 4200 doesn’t have an automatic milk frother. For fully automated milky coffees, you’ll need a cappuccino maker, such as the Delonghi Eletta ECAM44.660.B (read our review here). Delonghi has included a manual milk frothing arm though, which it calls a “Cappuccino” system. This does a good job of producing creamy foam that tastes wonderful. Be prepared to spend time practising before you can make the perfect latte or cappuccino though. We also recommend buying a separate jug and thermometer for best results. One thing to note is that switching from the steam function back to coffee can take a few minutes, while switching in the opposite direction is almost instant. If you want to make two milky coffees, release the steam first to ensure the machine is ready to brew coffee in less time. All coffee machines require a certain amount of maintenance – and the ESAM4200 is no exception. You’ll need to regularly clean the ground coffee container, drip tray, water tank, spouts, funnel, infuser and inside the machine. This might sound like a lot, but most of the cleaning tasks are quick and easy. Full instructions are provided in the manual, including how to use the descaling feature, and the machine does a basic auto-clean whenever you shut it down. Be prepared to dedicate time every few weeks to maintaining it though. Cleaning the inside of the machine is the fiddly part – even with the removable brew unit – so plan to spend extra time on this particular task. As you would expect, the Delonghi Magnifica ESAM4200 has both automatic rinse and de-calcification programs. These are essential for keeping the machine running smoothly and maintaining your espresso’s quality. A minor complaint is that the ESAM4200 doesn’t take “no” for an answer – especially when it needs descaling. You are forced to descale it whenever the ESAM4200 decides it’s time, which can be annoying if you just want a quick cup of morning coffee. 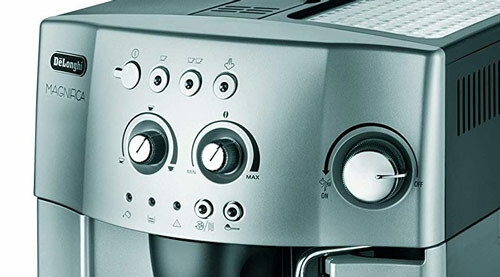 Delonghi has included a variety of other features with the Magnifica ESAM 4200. These include an automatic shut-off function, drip-tray level indicator, empty bean container indicator, empty water container indicator and a stand-by function. There’s also an energy saving function, which is great if you want to minimise your coffee-related electricity bills, and a cup warmer. We think the Delonghi Magnifica ESAM 4200 provides excellent value for money. It’s not the cheapest bean-to-cup coffee machine on the market, but there aren’t many models that can match its versatility, durability and coffee taste in this price range. You don’t get the advanced display, smart functionality and other bells-and-whistles found on newer models. But for producing consistently aromatic and tasty espresso, the ESAM4200 is a brilliant machine. Is the spout tall enough for a “regular” mug? Yes. The spout is adjustable and can be adjusted for both smaller cups and regular mugs. Delonghi ESAM 2800 Vs ESAM 4200 – What’s the Difference? The Caffe Corso ESAM 2800 and Magnifica ESAM 4200 have a similar appearance and share many features. Both are automated bean-to-cup coffee machines with a simple control panel, 1.8 litre water tank, Eco mode and burr grinder. They also both produce excellent espresso and have a milk frothing wand for manual cappuccinos. What are the differences though? The 2800 only has 7 grind coarseness settings and there isn’t an option to adjust water temperature. It’s also quite slow in comparison to other coffee machines. 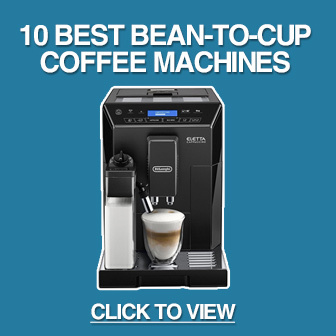 The Delonghi Magnifica ESAM4200 is an outstanding bean-to-cup coffee machine – especially for the price. It’s reliable, easy to use, and, most importantly, brews consistent espresso that’s almost a match for coffee shops. The milk frothing arm is also great for producing dense, creamy foam for milky coffees. There are a few drawbacks though. It’s relatively loud when grinding, although this is common for machines with burr grinders. The machine can be a bit finicky when it comes to maintenance, although the individual tasks are quick and easy. There’s also no advanced features found on recent machines, such as the ability to save user profiles or connect with smart devices. Despite these minor issues, the Magnifica ESAM4200 is a great choice if you want an automated coffee machine without spending a fortune. We highly recommend it.